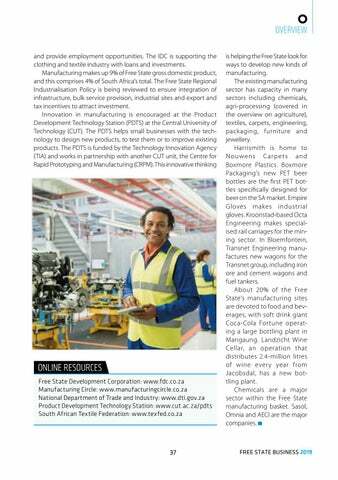 is helping the Free State look for ways to develop new kinds of manufacturing. The existing manufacturing sector has capacity in many sectors including chemicals, agri-processing (covered in the overview on agriculture), textiles, carpets, engineering, packaging, furniture and jewellery. Harrismith is home to Nouwens C ar p et s and Boxmore Plastics. Boxmore Packaging’s new PET beer bottles are the ﬁrst PET bottles specifically designed for beer on the SA market. Empire Gloves makes industrial gloves. Kroonstad-based Octa Engineering makes specialised rail carriages for the mining sector. In Bloemfontein, Transnet Engineering manufactures new wagons for the Transnet group, including iron ore and cement wagons and fuel tankers. About 20% of the Free State’s manufacturing sites are devoted to food and beverages, with soft drink giant Coca-Cola Fortune operating a large bottling plant in Mangaung. Landzicht Wine Cellar, an operation that distributes 2.4-million litres of wine ever y year from Jacobsdal, has a new bottling plant. Chemicals are a major sector within the Free State manufacturing basket. 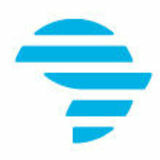 Sasol, Omnia and AECI are the major companies.